Today’s biggest news story comes from the world of sports. The NFL’s long-awaited report on allegedly deflated footballs used by the New England Patriots in the AFC championship game against Indianapolis was delivered by its authors, lawyers at the Paul, Weiss firm. The report concludes it is “more probable than not” that two low-level Patriots employees, John Jastremski and Jim McNally, conspired to deflate balls before the game in question, and likely on other occasions as well. But they are small fish. The report’s newsworthy claim is that Tom Brady “more probably than not” was “at least generally aware of the inappropriate activities of McNally and Jastremski.” It absolves Bill Belichick and other Patriots employees. Exponent engineers considered, and rejected, various explanations that have been offered for this discrepancy. In general, I am suspicious of this type of reasoning: X must have caused Y, since we have ruled out all other possible causes, when X is what we were trying to show all along. Maybe someone will be able to demonstrate that the facts are consistent with another explanation, maybe not. It should be noted that the whole “Deflategate” controversy is much ado about very little. 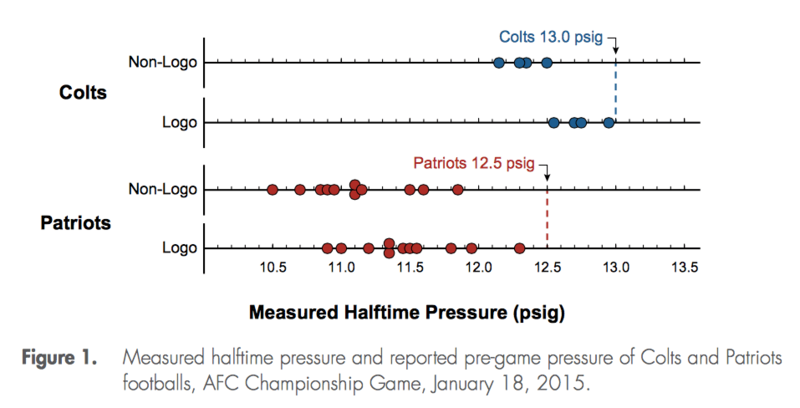 A large majority of the Patriots’ balls were underinflated by 1 to 1.5 psi. No one has plausibly suggested that this would have any effect on the team’s passing game, and in fact, the Patriots outscored the Colts 28-0 in the second half, after referees reinflated the balls. The Paul, Weiss report focuses on text messages between Jastremski (who was in charge of preparing balls for game day) and McNally, a very part-time employee who, before the AFC Championship game, delivered the balls to the referees, and then brought them to the field–with a 100-second stop in a men’s room. No doubt, there are some odd statements in these texts, and these two may well have been up to something. More doubtful, however, is the report’s finding that Tom Brady probably knew what Jastremski and McNally were doing. This conclusion is, I think, quite weak. Brady’s cooperation with the investigation seems to have been less than enthusiastic; for example, he did not turn over his cell phone records. Maybe this influenced the investigators. In any event, I think there are several instances where the evidence relied on by the investigators supports the opposite inference at least as strongly as the one they drew. What apparently happened here is that before the Jets game, the referees–perhaps finding the Patriots’ balls not inflated to 12.5 psi–pumped them up to “almost 16,” without checking to see what the final pressure was. Brady realized they were overinflated and complained to Jastremski. But how does this support the report’s conclusions? The investigators’ theory is that McNally (or someone) would deflate balls after they had been checked by the referees. Here, that obviously didn’t happen. Note, too, that these balls were much farther out of spec than the ones that the Patriots used in the AFC Championship game, and no one, other than Brady, apparently cared. Talked to him last night. He actually brought you up and said you must have a lot of stress trying to get them done. The investigators think that “he” is Tom Brady, and “get them done” means deflating footballs. But this doesn’t make much sense; the texts follow the Jets game in which McNally didn’t deflate anything. Moreover, Jastremski’s text sounds as though he is trying to placate McNally. Did Brady actually say any such thing to Jastremski? Who knows? Brady’s own texts, as set forth in the report, are entirely consistent with, and tend to support, his innocence. The report makes much of the fact that Brady rarely, if ever, telephoned or texted Jastremski prior to the AFC Championship game that gave rise to the deflation controversy. Beginning on the day after that game, they talked a number of times on the telephone and exchanged several texts. But how is this evidence of Brady’s guilt? When people were going crazy over the alleged football deflations, it is entirely reasonable that Brady would want to talk with the guy who was in charge of preparing the balls. The fact that Brady didn’t call or text Jastremski prior to the controversy doesn’t show that he was in on the plot, if there was a plot: it is evidence to the contrary. “You didn’t do anything wrong.” Brady’s communications are consistent with trying to buck up a low-level employee who suddenly is the target of an investigation. This exchange is an hour or so later; “Dave” is Dave Schoenfeld, the Patriots’ Head Equipment Manager. The report makes a major point of the fact that Brady signed a football and other memorabilia for both Jastremski, whom Brady described as a friend, and McNally, whom Brady said he didn’t know. This apparently is intended to fill an obvious gap in the narrative: it is evident from his texts that McNally disliked Brady, and the Patriots must have paid him hardly anything for his very part-time work. So what was in it for him? I find the memorabilia angle unpersuasive; Brady must constantly sign balls, jerseys, etc. for Patriots employees. What is left? The report’s strongest argument, perhaps: “we believe it is unlikely that an equipment assistant and a locker room attendant would deflate game balls without Brady’s knowledge and approval.” A plausible point, although the report also says that Brady’s preference for a ball inflated to 12.5 psi was well known. Further, Brady himself has said that Jastremski and others spend a great deal of time preparing the footballs for each game; quarterbacks want to throw balls that are appropriately broken in, not new, slippery ones out of the box. Brady says that prior to game time, he personally handles the balls that have been prepared and selects the ones whose feel he likes best to use in the game. From that time on, Brady says, he doesn’t want anyone to do anything to the footballs. That is a plausible narrative, too. The football deflation story is complicated and perhaps not worth unraveling. There is zero reason to believe that the minor underinflation that occurred at the AFC Championship game was of any significance, and it seems likely that many balls have been either underinflated or overinflated in NFL games, without anyone noticing or caring. Further, I am not saying that the evidence as marshaled in the Paul, Weiss report exonerates Tom Brady. For all I know, he may plead guilty tomorrow. But, based on the evidence presented in the report, the claim that it is more likely than not that Brady was involved in a football deflation scheme is dubious at best.